Clickbooth affiliates can rely on us for the best offers, guaranteed on-time payments and cutting edge technology. Our team of industry veterans will provide best practices and insights that take your affiliate marketing to the next level and you’re also likely to gain a lifelong friend. CB’s Account Managers get voted #1 in the industry and have been known to attend client weddings. It’s not uncommon for you to test our offers, be blown away by the performance and swap all of your traffic to Clickbooth. We have thousands of curated, top performing, exclusive offers across 20+ verticals. Our team of developers is constantly cranking out value-add tools to increase your performance and make your life easier. At the top is Brand & Image Rotation - a piece of code that allows affiliates to update their pages once and run multiple offers through one link, with corresponding product names and images. Multi-Level Offer Priority also ranks as a fan favorite - letting you select specific offers to run before you leverage our algorithm if your cap hits. Have an idea for a new feature? Let us know, we do weekly releases. We laugh when competitors list payments as a benefit, but there are too many fly-by-night networks. For us, payment, regardless of whether or not the advertiser pays, is a requirement and we’ve never missed a payment in our 15+ years as a business. Need faster payments? Show us your volume. Field description is required and must be at least 10 characters long. Field description must be at least 10 characters long. Please read to the bottom of Terms and Conditions to activate agreement option. 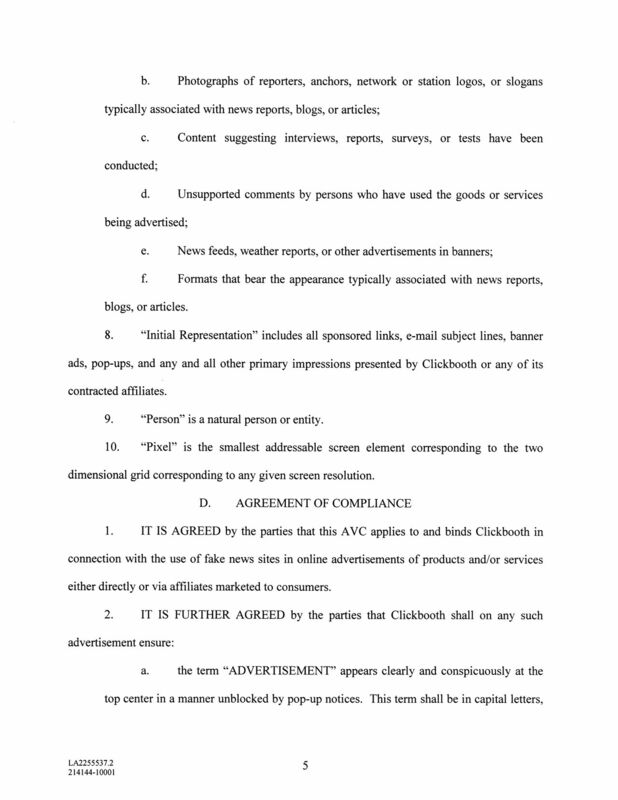 The following Terms and Conditions (“Terms and Conditions”), together with any and all applicable Acceptable Use Policies (“AUP” and together with the Terms and Conditions, the “Agreement”), set forth the terms and conditions which shall govern the relationship between Clickbooth.com, LLC, its affiliates and subsidiaries (collectively "Clickbooth") and you as a publisher ("You" or ”Publisher”) using the advertising service (the “Service”) offered through the Clickbooth network (“Clickbooth Network”) located at www.clickbooth.com (the “Site”). You and Clickbooth may also be individually referred to herein as a "Party" and collectively as "Parties." You agree to use the Site, the Service and any additional products and/or services offered by Clickbooth only in accordance with the Agreement. Clickbooth reserves the right to make changes to the Site, the Service and the Agreement at any time and without prior notification. The latest Agreement will be posted on the Site. Your continued use of the Site and/or the Service after any such modification thereof shall constitute Your consent to such modification. Therefore, You should regularly check the Site for updates and/or changes. For purposes of the Agreement “Publisher” includes the individual, company or entity and, without limitation, any parent entities, owners, subsidiaries, publishers, predecessor or successor entities, and any agents, officers, directors or employees acting on behalf of same, registering with Clickbooth to use the Service. If You do not agree to the Terms and Conditions in its entirety, You are not authorized to: (a) register as a Publisher; (b) use the Service; and/or (c) use the Site, in any manner or form whatsoever. 1. Clickbooth Network. 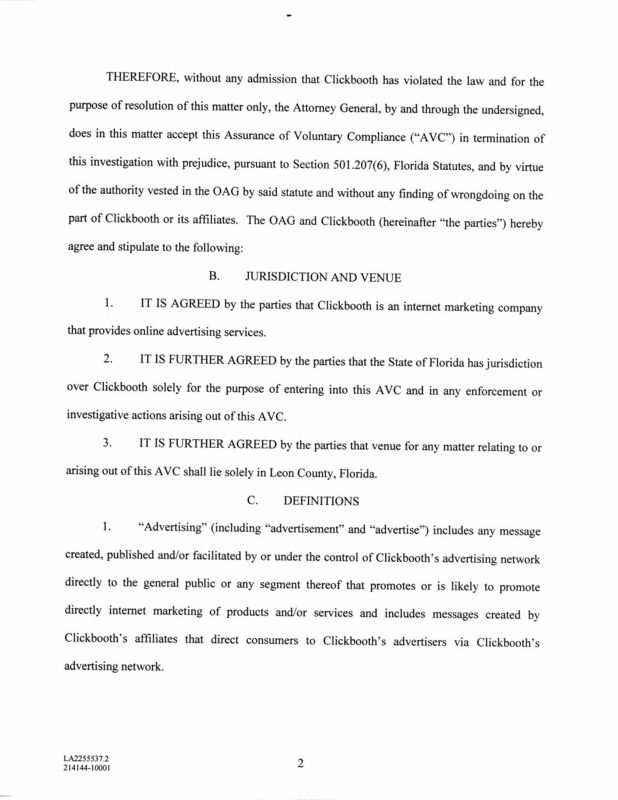 The Clickbooth Network enables Affiliates to apply for and, upon approval by Clickbooth, have an opportunity to earn Bounties (as that term is defined below) through participation in various advertising campaigns (“Programs”) offered by Clickbooth or its third party advertisers (“Advertisers”) in accordance with the Agreement. The terms and conditions of any and all Programs (each, the “Program Terms”) shall be posted on the Site. Clickbooth may, at its sole discretion, refuse to register You as an Affiliate and/or terminate Your participation in any Program at any time for any reason. 2. The Site and Service Clickbooth posts offers and associated creatives (“Creatives”) on the Site in connection with the Programs. 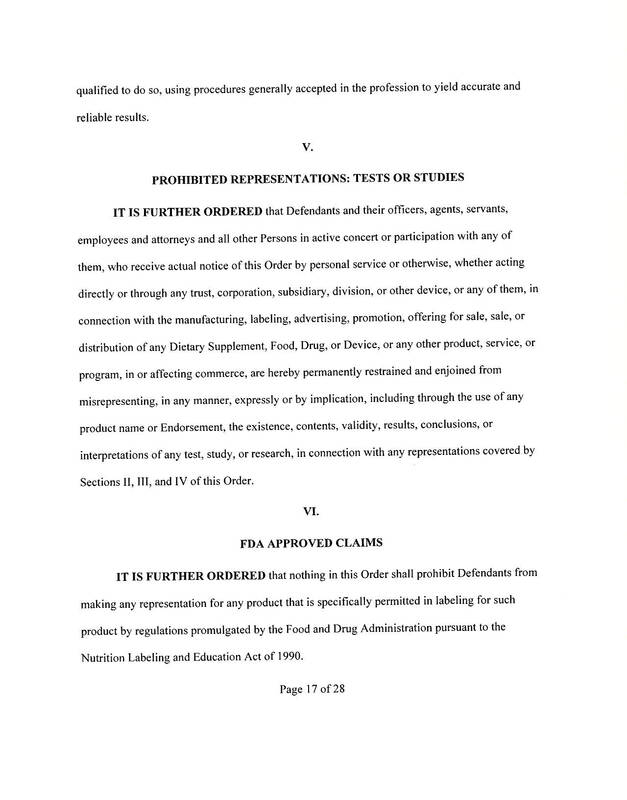 Approved Affiliates shall be permitted to download the Creatives: (a) for publication on Affiliate’s website and/or any other website published with, owned, operated and/or controlled by Affiliate (“Affiliate Website”); (b) for distribution in email messages sent to those e-mail addresses listed in Affiliate’s database and/or any other database affiliated with, owned, operated and/or controlled by Affiliate (“Affiliate E-mails”) and/or (c) other approved marketing channels. Clickbooth will specify the amount and terms under which You will earn payment (“Bounties”). Bounties are generated from a specified transaction (“Action”) as defined by Clickbooth. Actions include, without limitation, clicks, click-throughs, sales, registrations, impressions and leads. The applicable Action associated with each Program shall be set forth in the applicable Program Terms and, unless otherwise specified, such definition shall only apply with respect to that Program. If You accept a Program, You agree to place that Program's Creatives on the Affiliate Website and/or in the Affiliate E-mails, in accordance with the Agreement and the accepted Program Terms. Clickbooth may, at its sole discretion, change a Program at any time, upon prior notice to You, unless otherwise specified in the Program Terms. Similarly, You may cease participation in a previously accepted Program at any time, unless otherwise specified in the Program Terms. Clickbooth is responsible for displaying and administrating all active Programs and tracking associated Bounties and Actions. Program data compiled by Clickbooth including, but not limited to, numbers and calculations regarding Actions and associated Bounties (“Program Data”), will be calculated by Clickbooth through the use of industry standard tracking technology and shall be final and binding on You. Any questions regarding the Program Data must be submitted in writing within fourteen (14) days of initial appearance in the tracking system; otherwise the Program Data will be deemed to be accurate and accepted by You. Affiliate understands and agrees that on occasion the Service and/or Clickbooth Network may be inaccessible, unavailable or inoperable for any reason, including, but not limited to, the following: (i) equipment malfunctions; (ii) periodic maintenance procedures or repairs; or (iii) causes beyond the control of Clickbooth or which are not reasonably foreseeable by Clickbooth including, but not limited to, interruption or failure of telecommunication or digital transmission links, hostile network attacks, the unavailability, operation, or inaccessibility of websites or interfaces, network congestion or other failures. Clickbooth will attempt to provide the Service on a continuous basis. However, Affiliate acknowledges and agrees that Clickbooth has no control over the availability of the Service and Clickbooth Network on a continuous or uninterrupted basis. 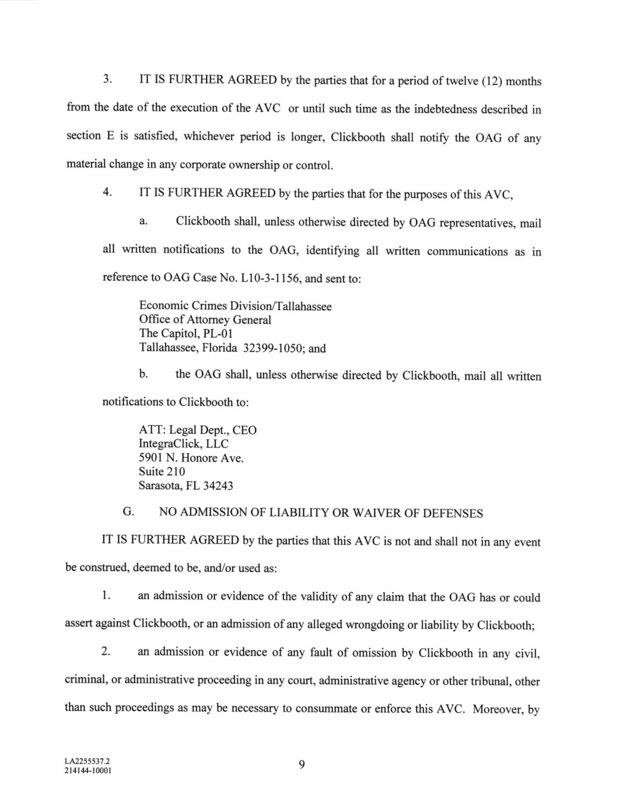 Terms of the Agreement are subject to Clickbooth hardware, software, and bandwidth traffic limitations. Clickbooth’s failure to deliver because of technical difficulties does not represent a failure to meet the obligations of the Agreement. 3. Creatives. Only Affiliate Websites, Affiliate E-mail distribution lists and other marketing channels that have been reviewed and approved by Clickbooth may be utilized in connection with the Site and Service. Clickbooth reserves the right to withhold, refuse or withdraw approval of any websites, email distribution lists and/or marketing channels for any reason, whatsoever, in Clickbooth’s sole discretion. Notwithstanding the foregoing, Clickbooth’s policies, specifications and/or recommendations with respect to any websites, email distribution lists and/or marketing channels used by You should not be construed as legal advice, or as sufficient guidelines to ensure that such websites, email distribution lists and/or marketing channels comply with applicable law. Clickbooth does not represent or warrant that such policies, specifications and/or recommendations are legally compliant or appropriate. Clickbooth assumes no obligation and hereby disclaims any liability for Your use of and/or reliance upon any such policies, specifications and/or recommendations. You should consult with Your legal counsel and/or other professional advisors before acting on any policies, specifications and/or recommendations as provided by Clickbooth. Affiliate shall not alter, modify or otherwise change the Creatives, or any Creatives-related feature, that it obtains access to in connection with any Program in any manner whatsoever, without Clickbooth’s prior express written consent. Unless otherwise specified in the applicable Program Terms or by Clickbooth, and subject to the restrictions herein, the positioning, placement, frequency and other editorial decisions related to Creatives shall be made by Affiliate. Notwithstanding the foregoing, Affiliate must comply, immediately, with any and all requests by Clickbooth to modify, alter, remove or otherwise change the positioning, placement, frequency and other editorial decisions related to the Creatives. Affiliate also shall not run any deactivated Creatives after the Advertiser has posted new Creatives to run in lieu of such deactivated Creatives for the applicable Program. AFFILIATE AGREES TO REVIEW THE AVAILABILITY OF CREATIVES THAT IT HAS PLACED WITHIN ITS MEDIA ON A DAILY BASIS. IT IS THE AFFILIATE’S SOLE RESPONSIBILITY TO CHANGE CREATIVES WITHIN ITS MEDIA WHEN A CREATIVE IS NO LONGER AVAILABLE IN THE CLICKBOOTH NETWORK. CLICKBOOTH ASSUMES NO RESPONSIBILITY TO NOTIFY AFFILIATE WHEN A SPECIFIC CREATIVE IS NO LONGER AVAILABLE IN THE CLICKBOOTH NETWORK. In addition, Site integration tags and tracking pixels (“Tags”) included in the Creatives or otherwise incorporated may not be altered under any circumstances. Clickbooth employs a testing system to ensure that You have not removed or altered the Tags. Altering, removing or disabling Tags may jeopardize Your ability to be paid for Actions and would be grounds for immediate termination of Your Affiliate account, with or without notice. 4. Sub-Affiliates. 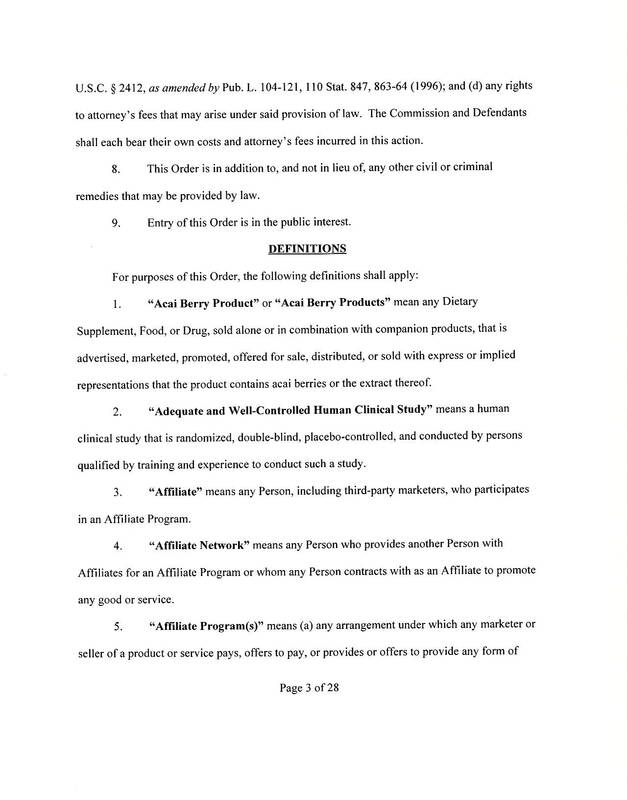 Affiliate may desire to use its business partners and/or associates to fulfill the obligations or exercise the rights under a particular Program. 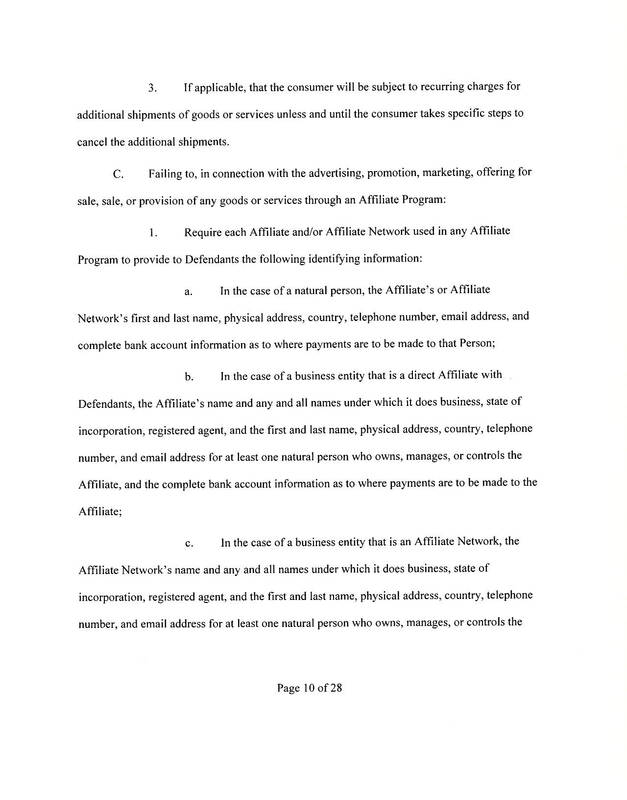 Any of Affiliate’s business partners or associates that participate in or perform any activities on behalf of Affiliate under the Agreement shall be considered to be a “Sub-Affiliate.” Clickbooth reserves the right to review and approve or reject any and all Sub-Affiliates and may revoke a prior approval of any Sub-Affiliate at any time and for any reason. Sub-Affiliates must meet the same criteria for approval as the Affiliate as set forth in the Agreement and must comply with all the terms and conditions that are applicable to Affiliate under the Agreement and the applicable Program Terms. Affiliate is responsible for and shall fully and unconditionally indemnify Clickbooth for any and all actions of any of its Sub-Affiliates, including the payment of legal fees and costs if necessary. Further, Clickbooth may, at its sole discretion, terminate an Affiliate at any time based on the actions of that Affiliate’s Sub-Affiliate(s). Once express approval of a Sub-Affiliate has been granted by Clickbooth, notices to the Affiliate shall be deemed notice to that Affiliate’s approved Sub-Affiliate(s). 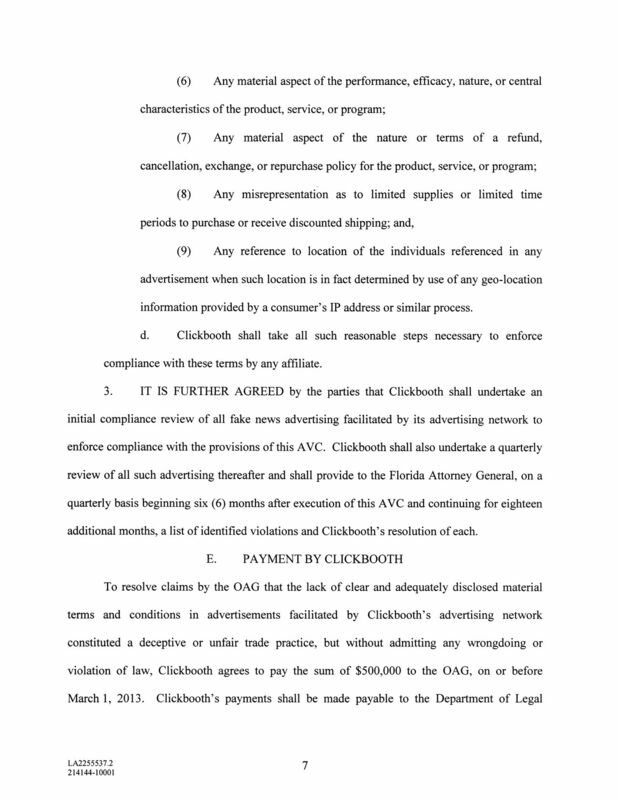 Affiliate agrees that Clickbooth is under no obligation to pay a Sub-Affiliate. Clickbooth further reserves the right to withhold or refuse payment to any Affiliate in the event that any of its Sub-Affiliates breach the Agreement. 5. E-mail Programs; Suppression Lists. Where use of e-mail marketing is authorized by Clickbooth and/or the applicable Program Terms, the following terms shall apply. Any and all e-mails, e-mail based Creatives transmitted, as well as any and all e-mail addresses supplied by Affiliate: (a) shall comply with all applicable federal and state laws including, but not limited to, the CAN-SPAM Act of 2003, as amended (“CAN-SPAM”) and any and all Federal Trade Commission implementing regulations; (b) must not infringe, misappropriate or otherwise violate any copyright, patent, trademark, trade secret or other similar intellectual property right, or otherwise violate or breach any duty toward, or rights of, any person or entity including, without limitation, rights of privacy and publicity; (c) must not result in any consumer fraud, product liability or breach of contract to which Affiliate is a party or cause injury to any third party; (d) must have accurate email header information (including source, destination, date and time, and routing information) and accurate, non-misleading subject lines and from lines; (e) must use only creatives, from lines and subject lines provided by Clickbooth, and Affiliate and its Marketing Affiliates are prohibited from removing or altering “subject” and “from” lines provided by Clickbooth; (f) must comply with California Business & Professions Code § 17529 and the Canadian Anti-Spam Legislation. Without limiting the foregoing, emails must not use a generic from line and a domain name that is privacy protected, unregistered, falsely registered, or which does not enable a recipient to contact the sender by performing a WHOIS look-up. Affiliate shall cause a valid physical postal address for Affiliate and/or the applicable Advertiser, as required by applicable law, to appear in each e-mail creatives, along with a functioning unsubscribe link (such unsubscribe link must remain active for at least thirty (30) days after e-mail delivery). Moreover, Affiliate must have active filters in place to prevent communications from being sent to any entity or person in Canada which include, at a minimum: (a) email filters (i.e. rejection of email addresses with “.ca” or other Canadian extensions); (b) zip code filters (rejection of Canadian zip codes); (c) area code filters (rejection of Canadian area codes); and (d) IP filters (rejection of Canadian IP addresses). Clickbooth reserves the right to add such address(es) should Affiliate fail to include same, but Clickbooth is in no way responsible for including such address(es) where Affiliate fails to do so. In addition, Clickbooth may make available, at a Clickbooth-designated FTP site (“FTP Site”), a suppression list (and associated login information), updated on a regular basis, generated from e-mail Programs transmitted by and/or through the Clickbooth Network for Affiliate’s use in connection with applicable Programs. Affiliate shall upload its own list of suppressed e-mail addresses to the FTP Site, if one is provided by Clickbooth. If the FTP Site is provided by Clickbooth, and no such e-mail addresses are supplied by Affiliate, Clickbooth may conclude that no such addresses exist. The suppression list and login provided by Clickbooth are deemed to be Confidential Information of Clickbooth, as defined herein. Suppression lists may not be used by Affiliate for any purpose other than to comply with applicable laws regulating the e-mail transmissions. Affiliate agrees to process any unsubscribe requests within five (5) days of being posted at the FTP Site. 6. Affiliate E-mail Lists. All Affiliate E-mails sent under the Agreement shall be delivered to addresses on e-mail lists owned or managed solely by Affiliate (“Affiliate E-mail Lists”). Brokering third-party deals to deliver Creatives without disclosing such to Clickbooth is strictly prohibited and grounds for immediate termination, as well as other legal remedies. Affiliate is required and agrees to maintain at all times during the term of the Agreement, and for a period of three years thereafter, complete and accurate subscriber sign-up/registration data for every subscriber to Affiliate’s Email List(s). Affiliate agrees that, within twenty-four (24) hours of Clickbooth’s request, it shall provide, at a minimum, the following subscriber sign-up/registration data for any email address that Affiliate sends an Affiliate E-mail to: (a) subscriber email address used to sign-up/register for Affiliate’s Email List; (b) subscriber’s IP address; (c) date and time of subscriber’s sign-up/registration for Affiliate’s Email List; and (d) location of subscriber’s sign-up/registration. 7. Payment. You agree to be paid the applicable Bounty rate for each Action verified by Clickbooth as specified by Clickbooth approximately thirty (30) days after the last day of a given calendar month, for Bounties realized in that month. You agree that payment for Bounties will be owed to You from the applicable Advertiser, and that corresponding payments shall be made by Clickbooth to You out of the funds actually collected by Clickbooth from the applicable Advertiser. Clickbooth shall have no payment obligation to Affiliate where Advertiser has not remitted sufficient payments to cover the Bounties otherwise due and owing Affiliate. 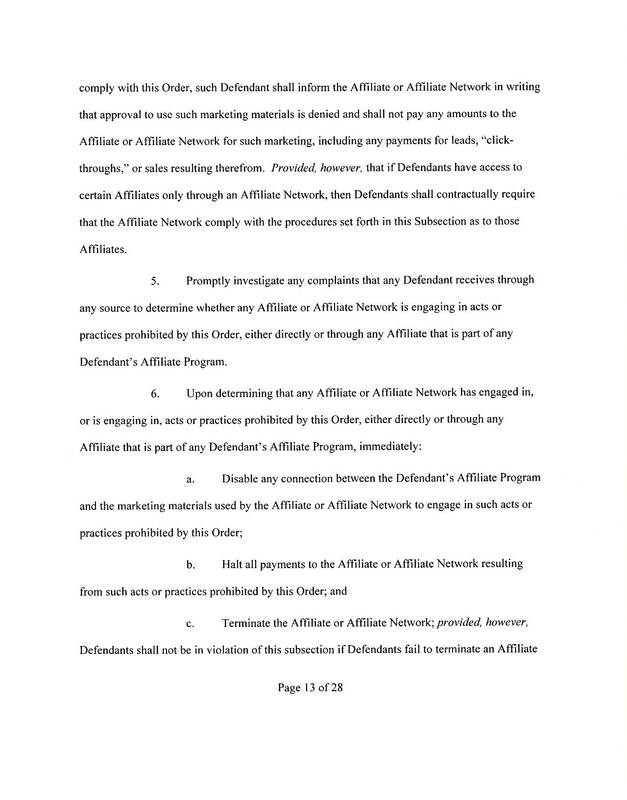 Instead, Affiliate shall have the right to pursue any and all legal remedies directly against any Advertiser that has not made funds available to pay sums due and owing to Affiliate for Bounties earned in connection with a particular Program. All Affiliate accounts will be paid in US dollars ($US). Notwithstanding anything contained herein to the contrary, no Bounty payments will be issued for any amounts otherwise due Affiliate that total less than Fifty Dollars ($50.00) (“Payment Threshold”). Upon termination of the Agreement, all legitimate moneys due to Affiliate that are actually collected from the applicable Advertiser, even amounts below the Payment Threshold, will be paid during the next billing cycle. Every Affiliate account must have a unique, valid taxpayer identification number (TIN), valid Social Security Number or other applicable unique government identification. All payments due hereunder shall be in U.S. dollars and are exclusive of any applicable taxes. Affiliate shall be responsible for all applicable taxes. An Advertiser may request that Clickbooth, or Clickbooth may on its own initiative, debit from the Bounties otherwise due and owing Affiliate an amount equal to a Bounty previously credited to Affiliate’s account where: (a) a return or cancellation has been made with respect to the applicable product and/or service; (b) there is an instance of a duplicate, fraudulent or incomplete entry or other similar error with respect to a customer order; (c) there are Actions that do not comply fully with the terms of the Agreement, including where the applicable non-complying Action is not the result of Affiliate’s action, omission and/or failure to comply with the terms and conditions of the Agreement; (d) there is non-receipt of payment from, or refund of payment to, the customer that entered into the subject Action; or (e) there is any failure on the part of Affiliate to comply with the Agreement and/or the applicable Program Terms (collectively referred to as a “Chargeback”). Chargebacks requested by an Advertiser in accordance with this Section 7 may be applied up to sixty (60) days after the end of the month in which the applicable Bounty was earned (“Chargeback Period”). 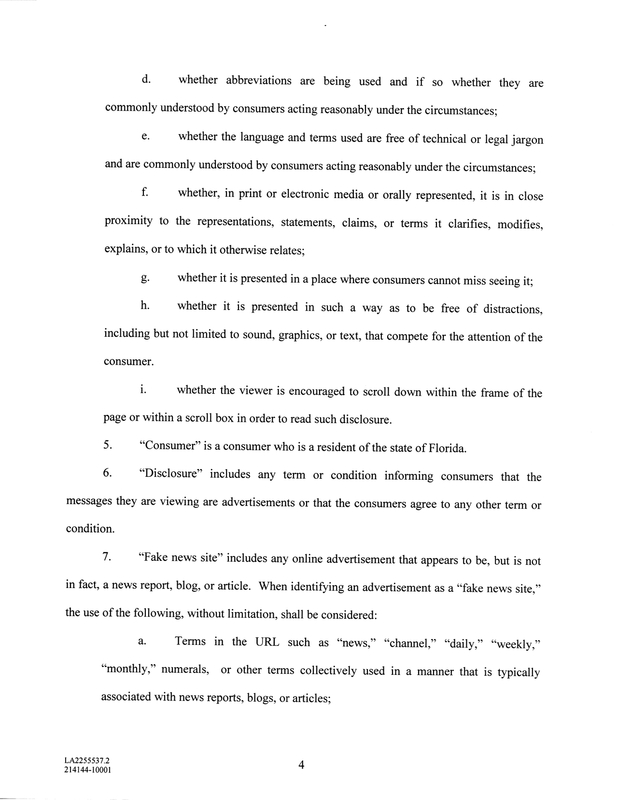 An Advertiser may request that the payment of a Bounty be postponed for one (1) payment cycle where: (i) Advertiser is verifying a lead (for Programs in which lead generation is a component of the Action); (ii) Advertiser has a product return policy that allows the underlying purchaser to return the product during the Chargeback Period; or (iii) the applicable Program Terms provide for such a postponement. The number or amount of Actions, credits for payments and debits for Chargebacks, as calculated by Clickbooth, shall be final and binding on Affiliate. 8. Fraud. Clickbooth actively monitors traffic, Actions, Bounties and other Program-related activities for potential fraud. If Clickbooth suspects that Your account has been used in a fraudulent manner, Your account will be deactivated effective immediately and with no notice to You pending further investigation. If You add Actions, or inflate Actions, through the use of fraudulent means of traffic generation, as determined solely by Clickbooth, You will forfeit all of the Bounties related to that Program, and Your Affiliate account will be terminated effective immediately. 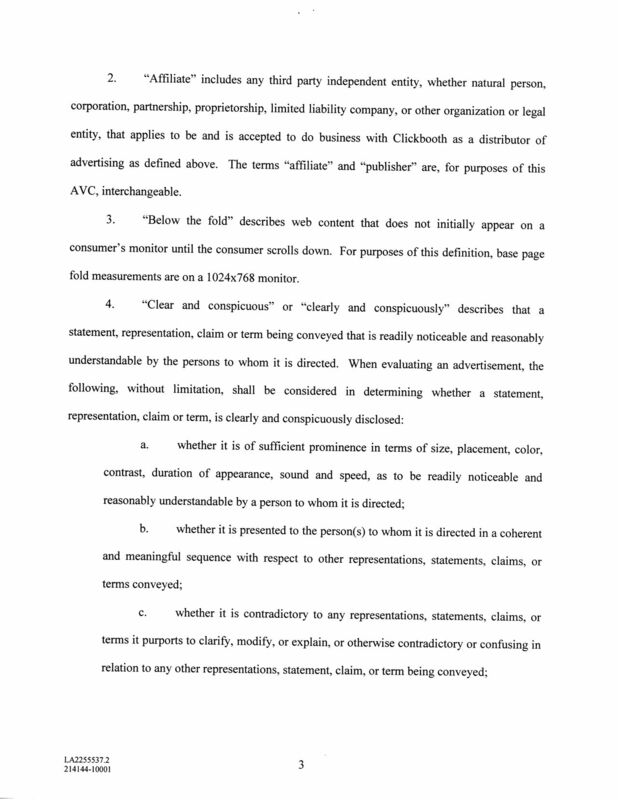 Clickbooth reserves sole judgment in determining fraud and You agree to be bound by any and all such determinations. It is the OBLIGATION of Affiliate to prove to Clickbooth that it has NOT engaged in fraud. Clickbooth will hold Your Bounty-related payments in 'Pending Status' until You have satisfactorily provided evidence that demonstrates to Clickbooth that You have not engaged in fraud. 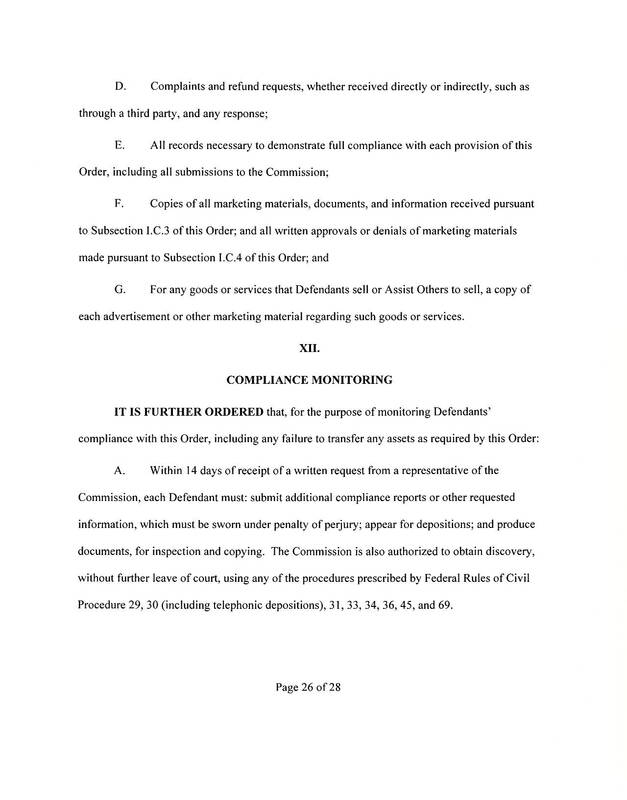 If You are unable to provide Clickbooth with satisfactory evidence that You have not engaged in fraud within seven (7) days of Your Bounties being placed in “Pending Status,” then Clickbooth reserves the right to terminate Your Affiliate account and cancel payment on the applicable Bounties, at its sole discretion and without any further obligations to You. 9. Term and Termination. The Agreement shall commence upon Clickbooth’s acceptance of Your Affiliate application and remain in effect until terminated as set forth herein. 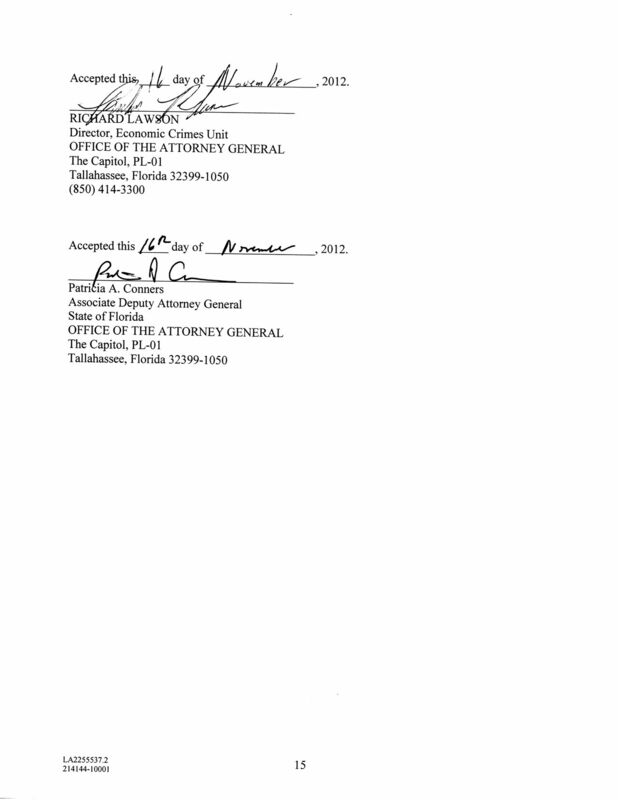 The Agreement may be terminated by either Party upon three (3) days’ prior written notice. In addition, Clickbooth reserves the right, in its sole and absolute discretion, to terminate a Program and/or remove any Creatives at any time for any reason, upon notice to You. Clickbooth also reserves the right to terminate Your access to the Site at any time with or without notice to You. Termination notice may be provided via e-mail and will be effective immediately. 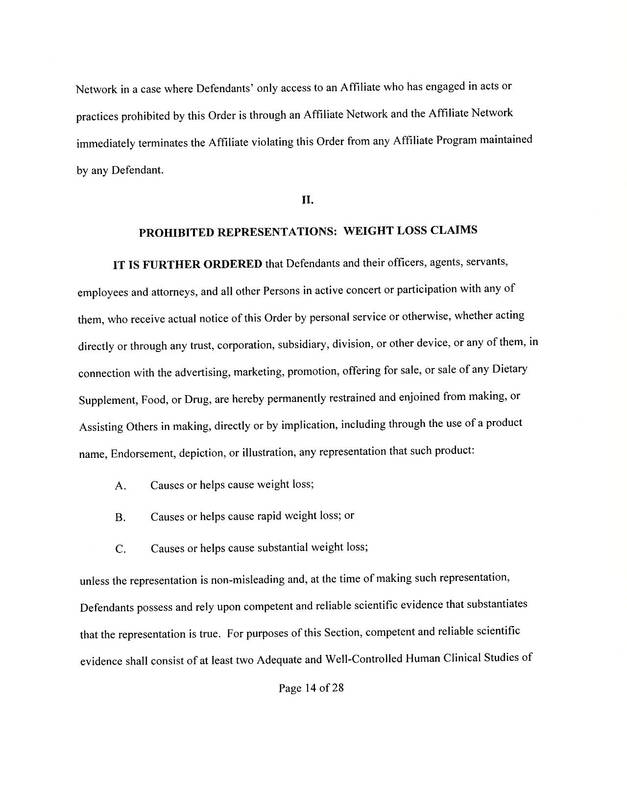 Upon termination, Affiliate agrees to immediately remove from its Affiliate Website(s) any and all Creatives, Clickbooth Code or other intellectual property made available to Affiliate in connection with its performance under the Agreement. The representations, warranties and obligations contained within the Agreement shall remain in full force and effect after termination of the Agreement. All payment obligations accruing prior to the date of termination shall survive until fully fulfilled. 10. Compliance. Clickbooth makes available to its Affiliates various policies and guidelines designed to reduce fraud and combat consumer deception. The policies and guidelines cover many topics including, but not limited to general advertising compliance, e-mail marketing, search engine marketing, lead generation, blog-based marketing and product review websites. 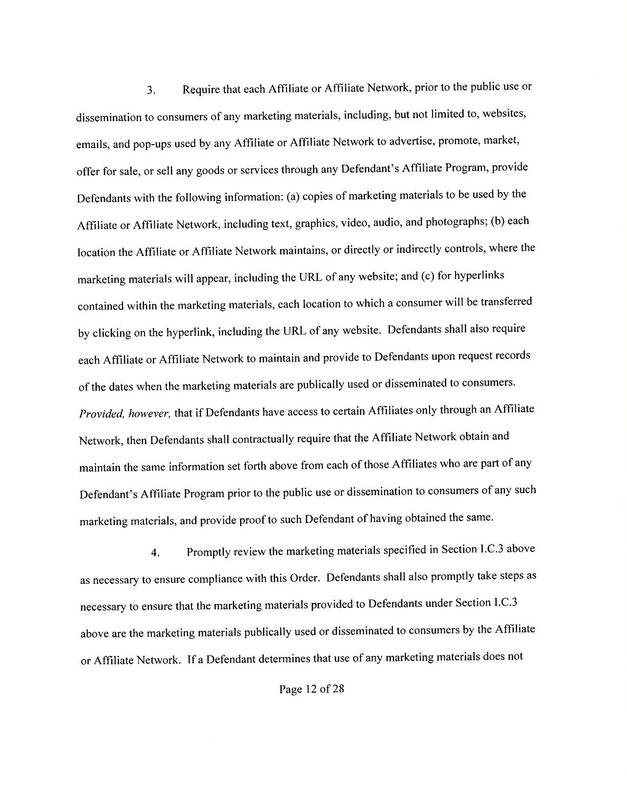 Affiliate hereby represents and warrants that it: (a) has read Clickbooth’s policies and guidelines, as same are made available here: http://support.clickbooth.com/support/solutions/folders/146482 ("Policy Web Pages”); (b) will regularly check the Policy Web Pages for updates; and (c) shall comply with any and all such policies and guidelines, as well as updates to same. Affiliate further represents and warrants that it has provided full and accurate information in the sign up process and thereafter with respect to providing to Clickbooth all websites, email practices and other methods of generating traffic to advertiser offers sourced from the Clickbooth network. 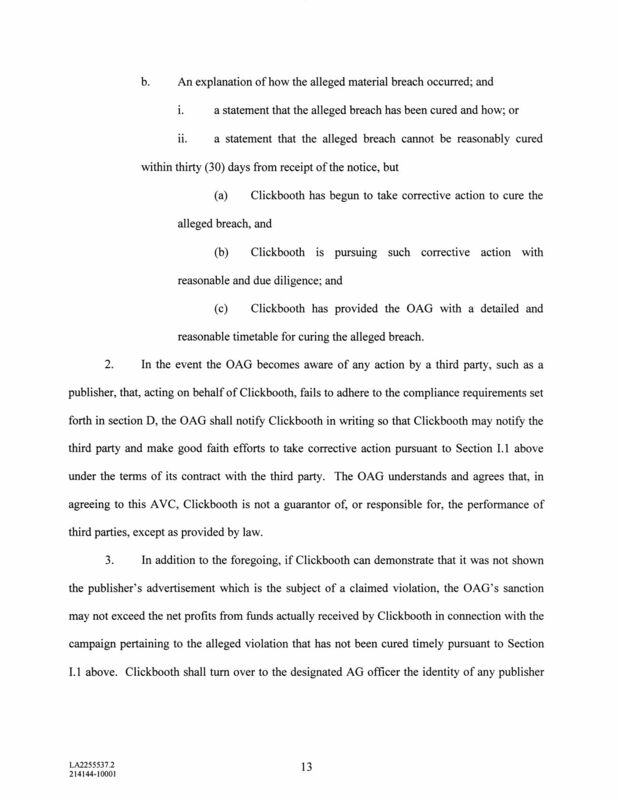 Specifically, prior to the public use or dissemination to consumers of any marketing material promoting an advertiser offer sourced from Clickbooth, Affiliate will provide Clickbooth Compliance with all marketing materials to be used here: http://clickbooth.freshdesk.com/support/solutions/articles/121539-manual-campaign-submission. Affiliate will also maintain and provide to Clickbooth upon request records of the dates when the marketing materials are publically used. 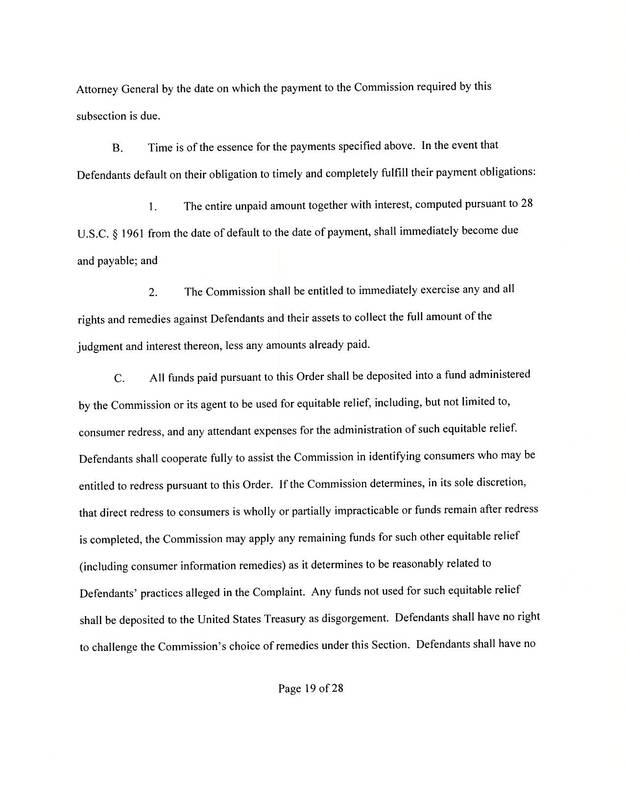 Failure to comply with the representations and warranties set forth in this Section 10 will result in disciplinary action including campaign denial, account termination and the forfeiture of all monies owed. 13. Data Protection Addendum; International Compliance. Data Protection Addendum; International Compliance. 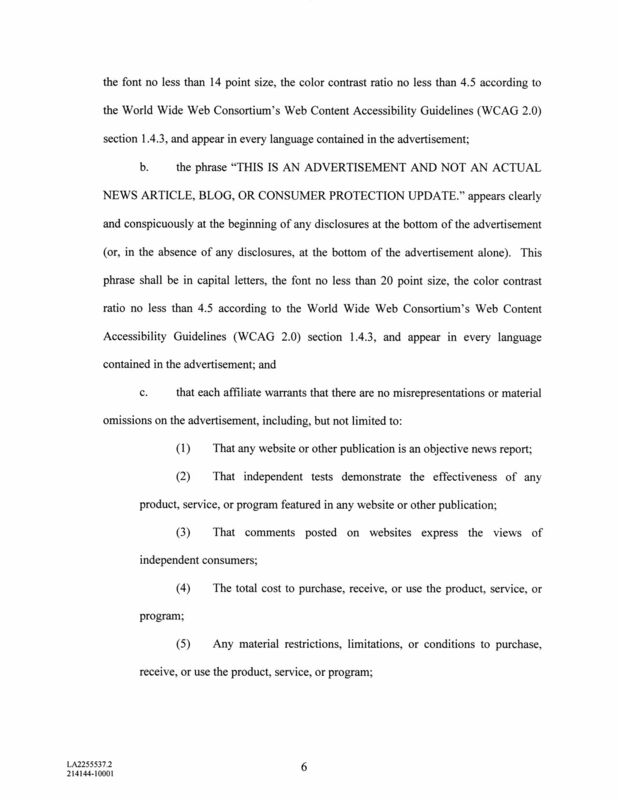 Publisher has read and agrees to comply with the Data Protection Agreement, available at http://support.clickbooth.com/support/solutions/articles/4000122184-affiliate-data-protection-addendum, which is incorporated herein by reference. 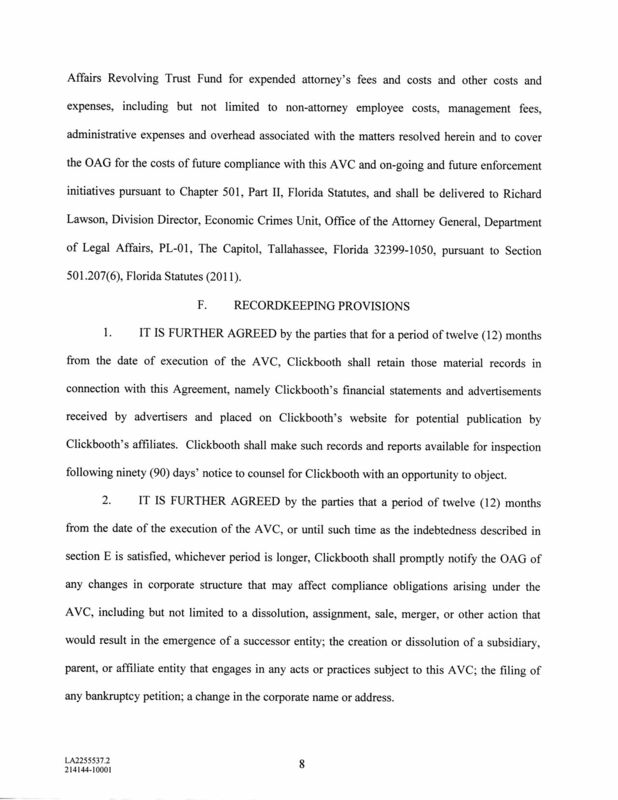 Before approving any sub-Publisher to run an Ad through Clickbooth, Publisher shall present and secure the written agreement to the Data Protection Addendum from said sub-Publisher. Publisher agrees that, where applicable, its marketing and data collection practices shall comply at all times with the United Kingdom Data Protection Act of 1998 (as amended), the General Data Protection Regulation (GDPR) (EU) 2016/679, as amended and adopted by the member states of the EU, and all related directives, acts, or regulations. Publisher represents and warrants that its consumer data collection practices are performed in a manner that obtains the necessary knowing and frequent consent from consumers and that all consumer data is stored using industry-standard or better security protocols. 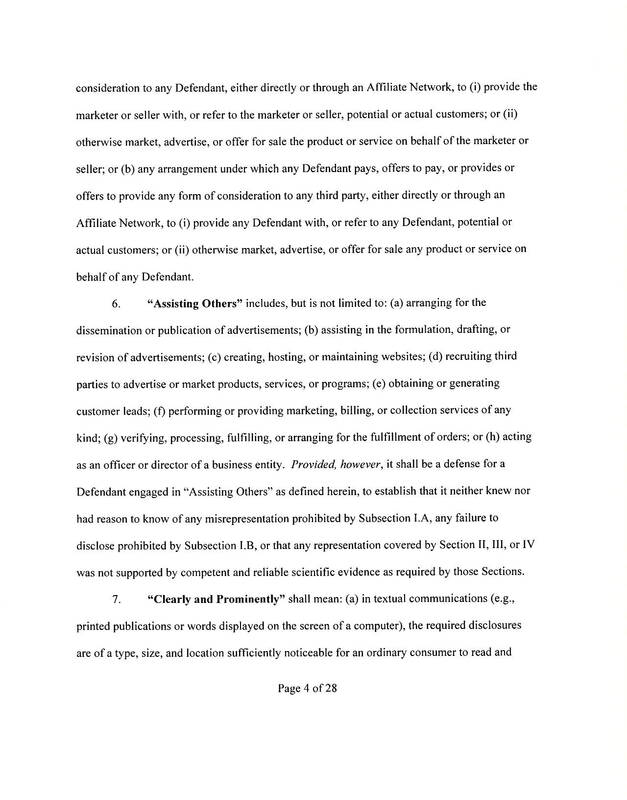 If Publisher is either located outside the United States or offering or distributing (or potentially distributing) an Ad outside the United States, Publisher represents and warrants that (1) Publisher is familiar with the particular laws, regulations and industry customs in those countries in which Publisher is located and/or distributing the Ad, (2) Publisher has previous experience distributing Ads in such countries, and (3) Publisher will comply with all laws, regulations and industry customs applicable to the operation of its business, its marketing practices, and the collection and/or transfer of consumer data by Publisher in such countries. 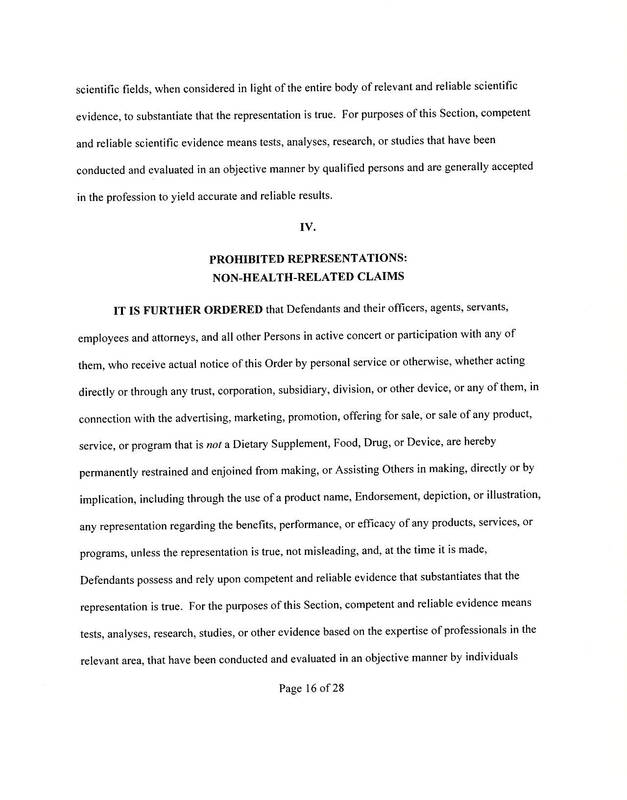 To be clear, Publisher is responsible for understanding and complying with all advertising laws, regulations and customs in both the jurisdiction where the advertising takes place and the jurisdiction where Publisher is located. Publisher’s obligations and liabilities under this Paragraph and the Data Protection Addendum shall extend to the conduct of all sub-Publishers. 14. Customer Information; Non-Disclosure. Any and all information submitted by end-user customers (“Customer Information”) in connection with a Program shall be considered proprietary to and owned by Clickbooth. Such Customer Information is Confidential Information (as that term is defined below) of Clickbooth and may not be utilized or otherwise disclosed by You. In addition, You acknowledge that all non-public information, data and reports made available by Clickbooth hereunder or otherwise as part of the Services is proprietary to and owned by Clickbooth. All proprietary and Confidential Information is protected by copyright, trademark and other intellectual property laws. You agree not to reproduce, disseminate, sell, distribute or commercially exploit any proprietary or Confidential Information of Clickbooth in any manner. These non-disclosure obligations shall survive termination or expiration of the Agreement. 15. Proprietary Rights. Subject to the Agreement and any underlying Program Terms, Clickbooth grants to Affiliate a revocable, non-transferable, royalty free, international license to display on, and distribute through, the Affiliate Website, Affiliate E-mails and/or other approved marketing channels, the Creatives, and any and all associated trademarks, service marks, tradenames and/or copyrighted material (“Intellectual Property Content”) that Clickbooth provides to Affiliate through the Clickbooth Network for the limited purposes of promoting Programs to end users. 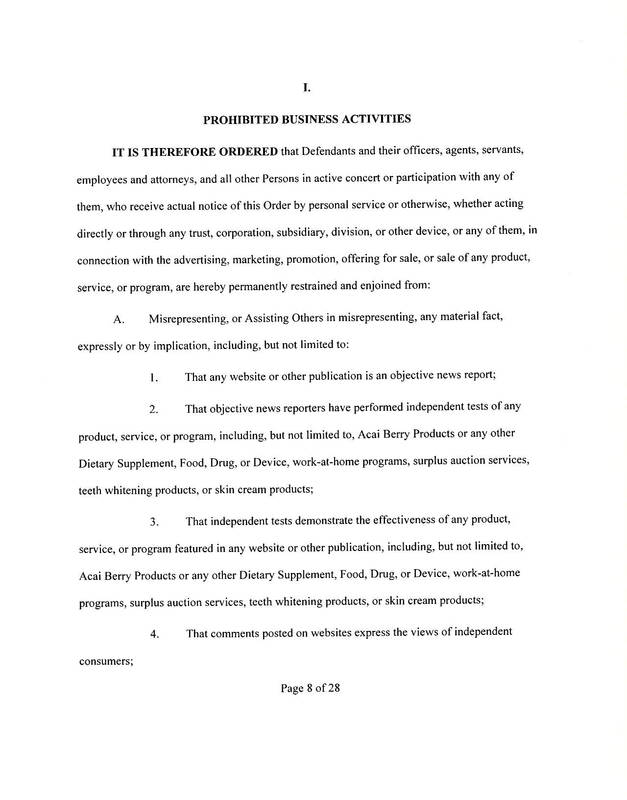 Affiliate may not remove or alter any copyright or trademark notices. The Intellectual Property Content and other matters related to the Clickbooth Network, Programs, Creatives and Site are protected under applicable copyright, trademark and other proprietary rights. The use, copying, redistribution and/or publication by Affiliate of any part of the Clickbooth Network, Programs, Creatives and/or Site, other than as expressly permitted hereunder, are strictly prohibited. Affiliate does not acquire any ownership rights to the Clickbooth Network, Programs, Creatives and/or Site. The availability of the Clickbooth Network, Programs, Creatives and Site does not constitute a waiver of any rights related thereto. No part of the Site may be reproduced in any form or incorporated into any information retrieval system, electronic or mechanical. You may not use, copy, emulate, clone, rent, lease, sell, modify, decompile, disassemble, reverse engineer or transfer the Site, Site content or any portion thereof. 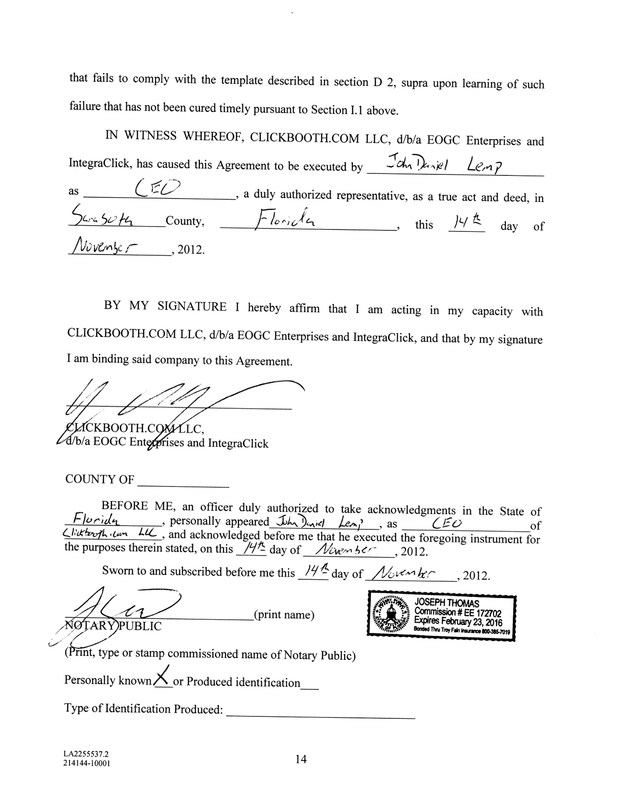 Clickbooth reserves any rights not explicitly granted in the Agreement. 16. Limitation of Liability; Disclaimer of Warranty. IN NO EVENT SHALL CLICKBOOTH BE LIABLE TO YOU OR ANY THIRD PARTY (INCLUDING, WITHOUT LIMITATION, ANY CUSTOMERS OBTAINED THROUGH YOUR MARKETING EFFORTS) FOR ANY DAMAGES OF ANY KIND ARISING FROM YOUR USE OF THE SITE, A PROGRAM, ADVERTISERS’ UNDERLYING PRODUCTS AND/OR SERVICES OR YOUR DISPLAY OF ANY CREATIVES ON OR THROUGH YOUR AFFILIATE WEBSITE AND/OR AFFILIATE E-MAILS INCLUDING, BUT NOT LIMITED TO, SPECIAL, INDIRECT, INCIDENTAL, PUNITIVE AND/OR CONSEQUENTIAL DAMAGES, EVEN IF CLICKBOOTH HAS BEEN ADVISED OF THE POSSIBILITY OF SUCH DAMAGES. CLICKBOOTH’S MAXIMUM AGGREGATE LIABILITY TO AFFILIATE AND ANY THIRD PARTY UNDER ANY AND ALL CIRCUMSTANCES SHALL BE THREE HUNDRED DOLLARS ($300). 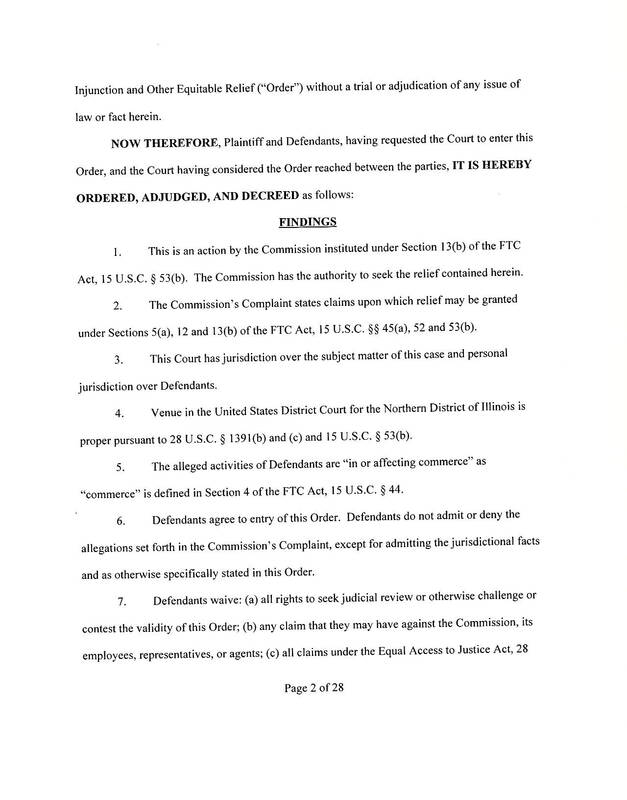 REGARDLESS OF ANY LAW TO THE CONTRARY, NO ACTION, SUIT OR PROCEEDING SHALL BE BROUGHT AGAINST CLICKBOOTH MORE THAN ONE (1) YEAR AFTER THE DATE UPON WHICH THE CLAIM AROSE. 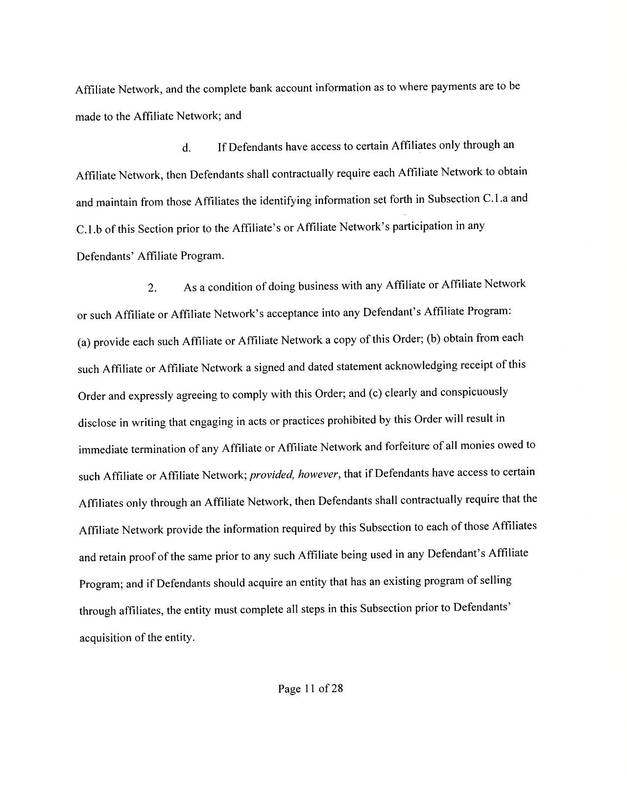 AFFILIATE RECOGNIZES AND ACKNOWLEDGES THAT THIS LIMITATION OF DAMAGES IS FAIR AND REASONABLE. THE SITE, CREATIVES, PROGRAMS, ADVERTISERS’ UNDERLYING PRODUCTS AND SERVICES, CONTENT AND SERVICES ARE PROVIDED ON AN "AS IS" AND "AS AVAILABLE" BASIS AND ALL WARRANTIES, EXPRESS AND IMPLIED, ARE DISCLAIMED (INCLUDING, WITHOUT LIMITATION, THE DISCLAIMER OF ANY WARRANTIES OF MERCHANTABILITY, NON-INFRINGEMENT OF INTELLECTUAL PROPERTY AND/OR FITNESS FOR A PARTICULAR PURPOSE). THE SITE, CREATIVES, PROGRAMS AND/OR ADVERTISERS’ UNDERLYING PRODUCTS AND SERVICES MAY CONTAIN BUGS, ERRORS, PROBLEMS OR OTHER LIMITATIONS. 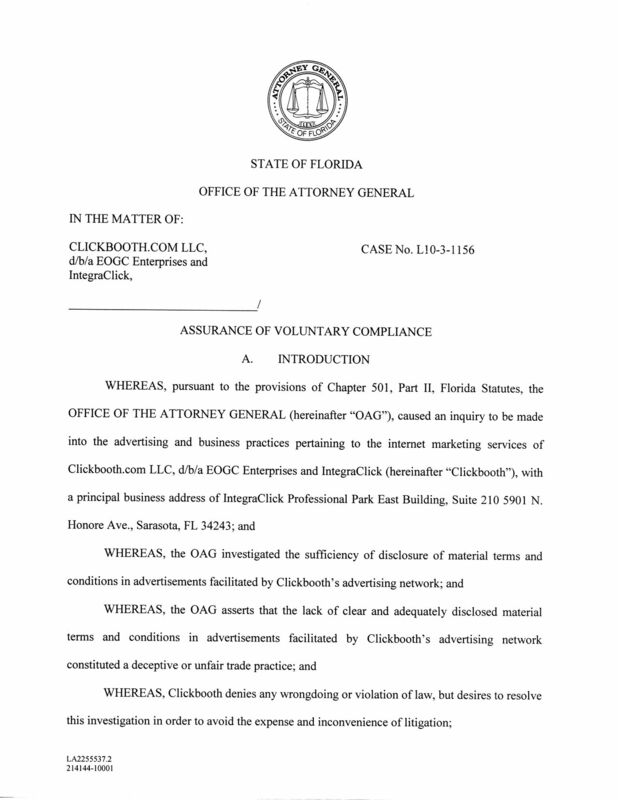 CLICKBOOTH HAS NO LIABILITY, WHATSOEVER, TO AFFILIATE OR ANY THIRD PARTY, FOR AFFILIATE’S USE OF, OR INABILITY TO USE, THE SITE, CREATIVES, PROGRAMS AND/OR ADVERTISERS’ UNDERLYING PRODUCTS OR SERVICES AND CLICKBOOTH DISCLAIMS ANY AND ALL WARRANTIES, EXPRESS AND IMPLIED, THAT AFFILIATE’S USE OF SAME WILL BE UNINTERRUPTED OR ERROR-FREE OR THAT ANY OF THE PROGRAMS WILL BE AVAILABLE TO AFFILIATE. THE NEGATION OF DAMAGES SET FORTH HEREINABOVE IS A FUNDAMENTAL ELEMENT OF THE BASIS OF THE BARGAIN BETWEEN CLICKBOOTH AND AFFILIATE. THE SITE, CREATIVES, PROGRAMS AND/OR ADVERTISERS’ UNDERLYING PRODUCTS AND SERVICES WOULD NOT BE PROVIDED TO AFFILIATE WITHOUT SUCH LIMITATIONS. CLICKBOOTH MAKES NO REPRESENTATION OR WARRANTY WITH RESPECT TO ANY RESULTS OBTAINABLE THROUGH THE SITE, CREATIVES AND/OR PROGRAMS. 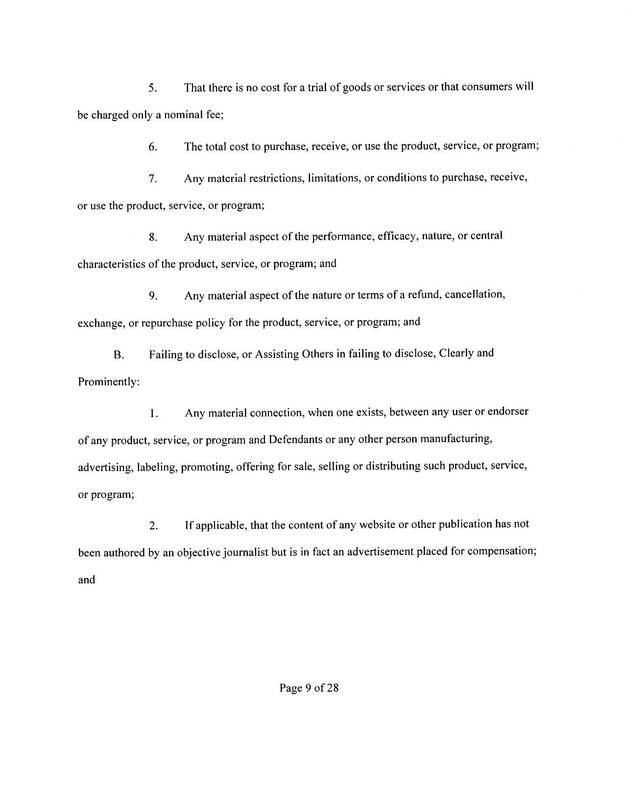 NO ADVICE OR INFORMATION, WHETHER ORAL OR WRITTEN, OBTAINED BY AFFILIATE FROM CLICKBOOTH AND/OR ANY ADVERTISER BY AND THROUGH THE SITE, CREATIVES AND/OR PROGRAMS SHALL CREATE ANY WARRANTY, REPRESENTATION AND/OR GUARANTEE NOT EXPRESSLY STATED IN THE AGREEMENT. 17. Indemnity. 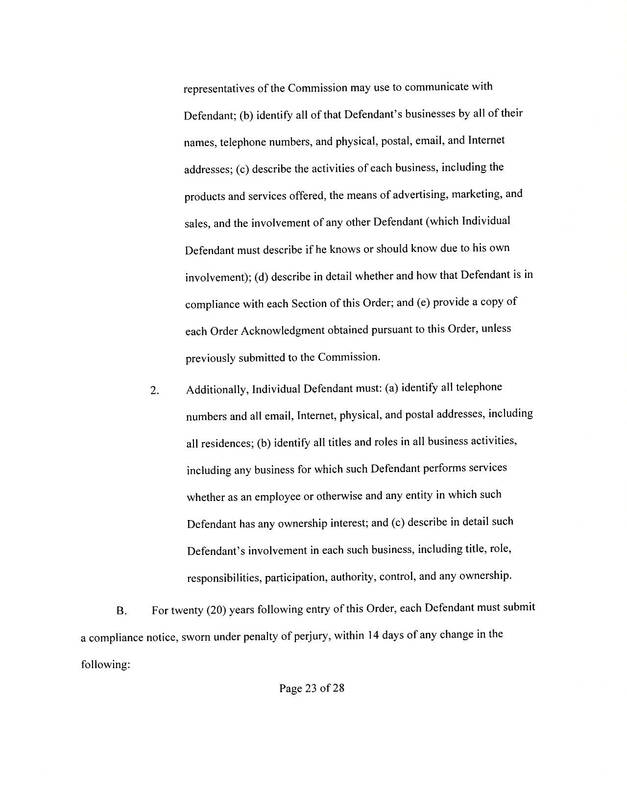 You shall indemnify, defend and hold Clickbooth, its Advertisers and each of their respective parents, Affiliates, subsidiaries, officers, partners, members, managers, employees, agents and attorneys, harmless from and against any and all claims, allegations, liabilities, costs and expenses (including reasonable attorneys' fees) arising out of or related to: (a) Your improper use of the Site, Program, Services and/or any Creatives; (b) any third party claim related to Your Affiliate Website, Affiliate E-mails and/or Your marketing practices; (c) any third party allegation or claim against Clickbooth and/or its Advertiser(s) relating to a violation of any and all state and federal laws or the laws of Your jurisdiction; (d) any content, goods or services offered, sold or otherwise made available by You on or through the Affiliate Website, Affiliate E-mails, other marketing channels or otherwise; (e) any claim that Clickbooth is obligated to pay any taxes in connection with payment made to You in connection with the Agreement and/or any Program; (f) breach and/or violation of the Agreement and/or any representation or warranty contained herein; and/or (g) Your use of the Site, Program, Services and/or any Creatives, in any manner whatsoever. 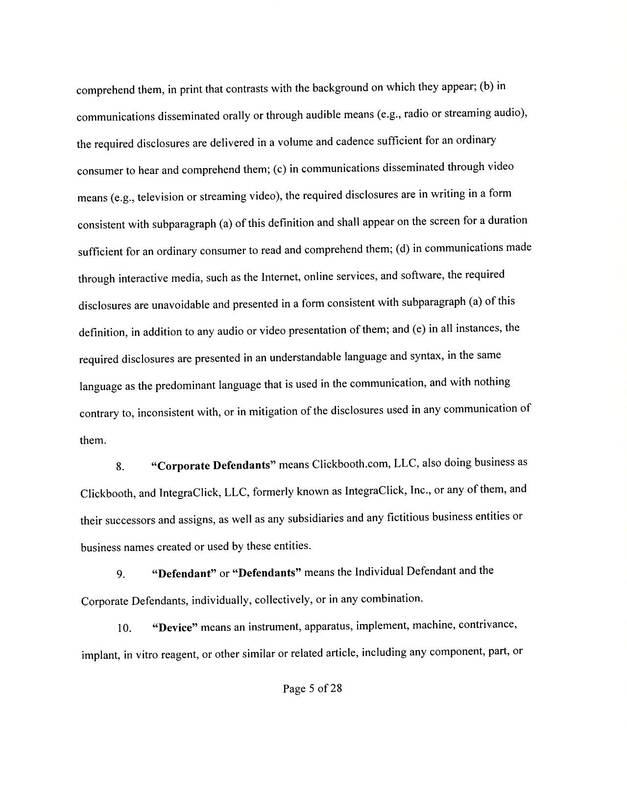 Clickbooth shall indemnify, defend and hold You harmless from and against any and all claims allegations, liabilities, costs and expenses (including reasonable attorneys' fees) by third parties arising out of any actual infringement of intellectual property rights resulting from Your display of the actual Creatives, in unaltered form, as provided in connection with any Program. 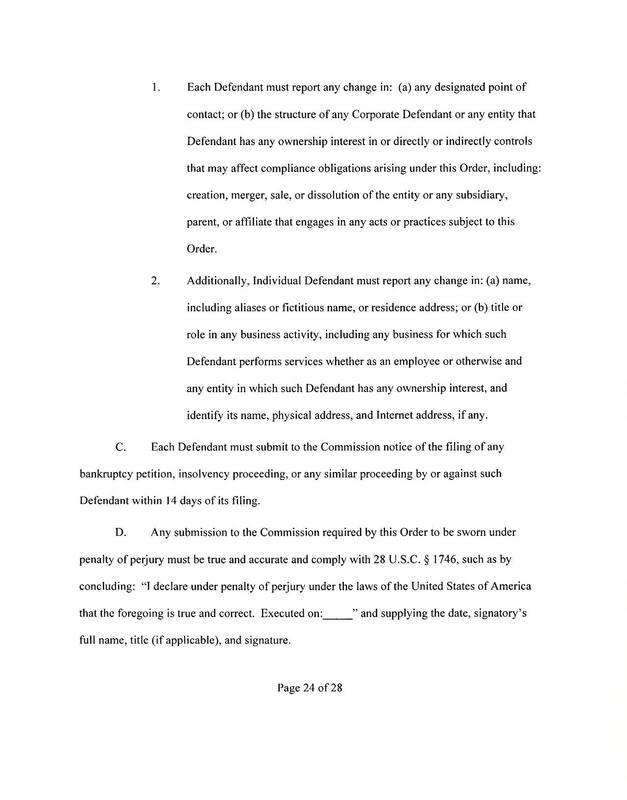 If any action is brought against either party (the "Indemnified Party") in respect to any allegation for which indemnity may be sought from the other party ("Indemnifying Party"), the Indemnified Party will promptly notify the Indemnifying Party of any such claim of which it becomes aware, except that failure to provide such notice shall not excuse the Indemnifying Party’s indemnification obligations under this Section 16 unless such failure materially prejudices the Indemnifying Party. 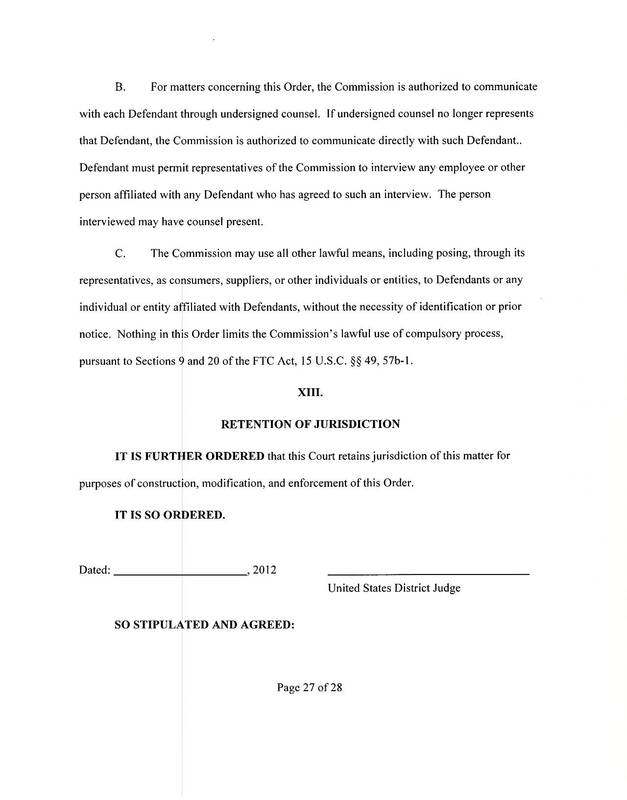 The Indemnified Party shall permit the Indemnifying Party to assume control over the defense of such claim, with counsel chosen by the Indemnifying Party that is reasonably acceptable to the Indemnified Party, provided however, that the Indemnified Party shall control the defense of any such claim that, in the reasonable opinion of such Indemnified Party, could have a material and adverse effect on the business, operations, assets or prospects of such Indemnified Party, and the reasonable costs and expenses thereof shall be included as part of the indemnification obligations of the Indemnifying Party hereunder. The Indemnifying Party will not acquiesce to any judgment or enter into any settlement that adversely affects the Indemnified Party‘s rights or interests without the prior written consent of the Indemnified Party. 18. Assignment. 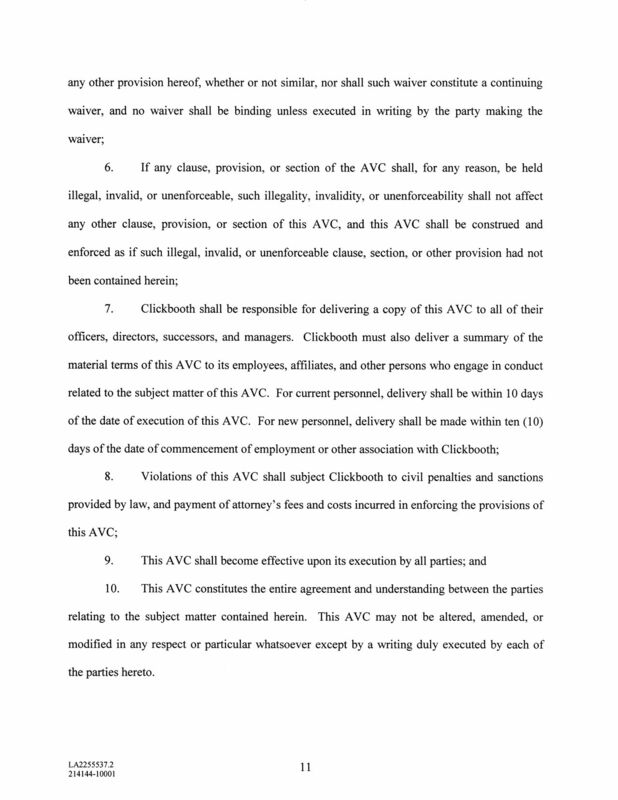 Clickbooth may assign the Agreement, or any portion thereof, at its sole discretion. You may not assign, transfer or delegate any of Your rights under the Agreement without the prior written consent of Clickbooth, which may be withheld for any reason, and any attempts to do so shall be null and void. Further, any such attempts may result in Clickbooth, at its sole discretion, immediately terminating the Agreement and/or Your participation in any Program, without any liability to Clickbooth. The Agreement will be binding on, inure to the benefit of and be enforceable against, the Parties’ successors and assigns. 19. Jurisdiction and Venue. 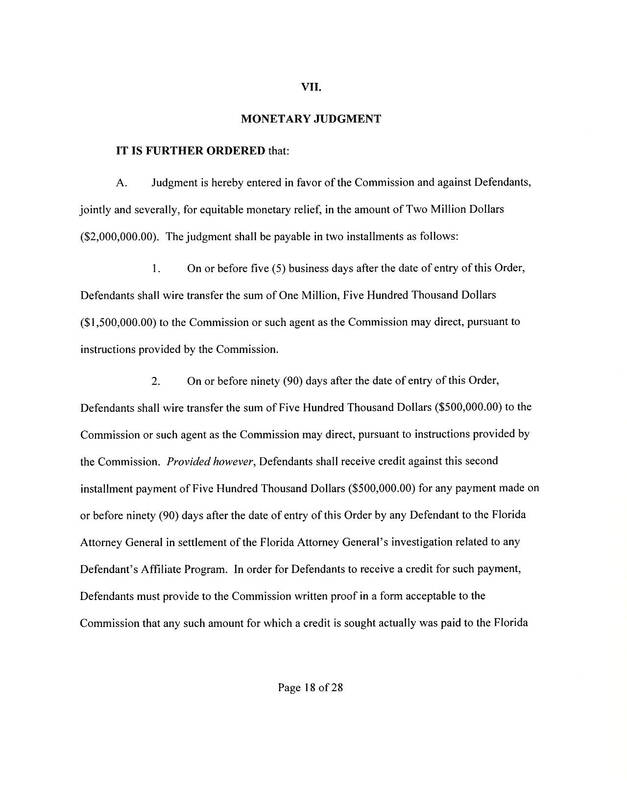 The Agreement shall be construed and governed by the laws of the State of Florida, without giving effect to principles of conflicts of law. 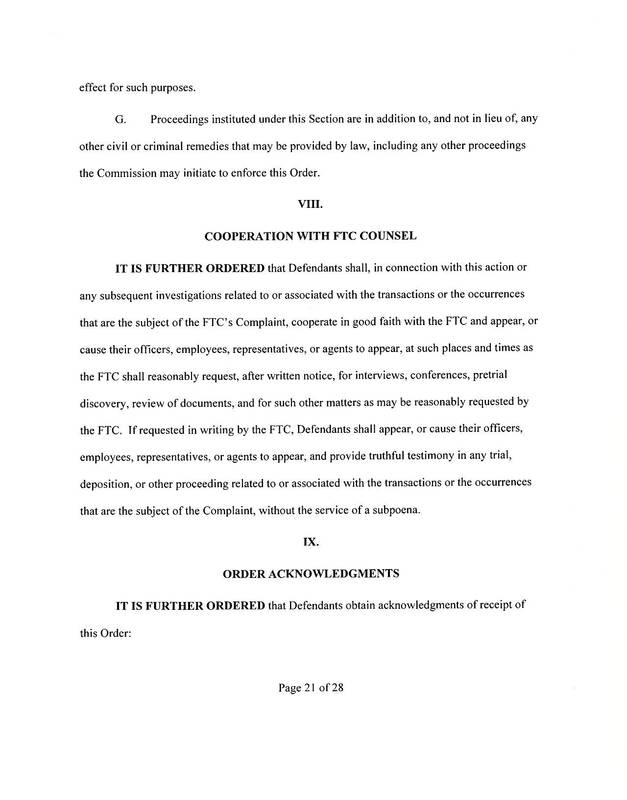 Any and all disputes or controversies whether of law or fact of any nature whatsoever arising from or respecting the Agreement shall be decided by arbitration by the American Arbitration Association ("Arbitrator"), in accordance with the rules and regulations of that Association. Arbitration shall take place in Sarasota, FL. At the request of Clickbooth, arbitration proceedings will be conducted in secrecy. 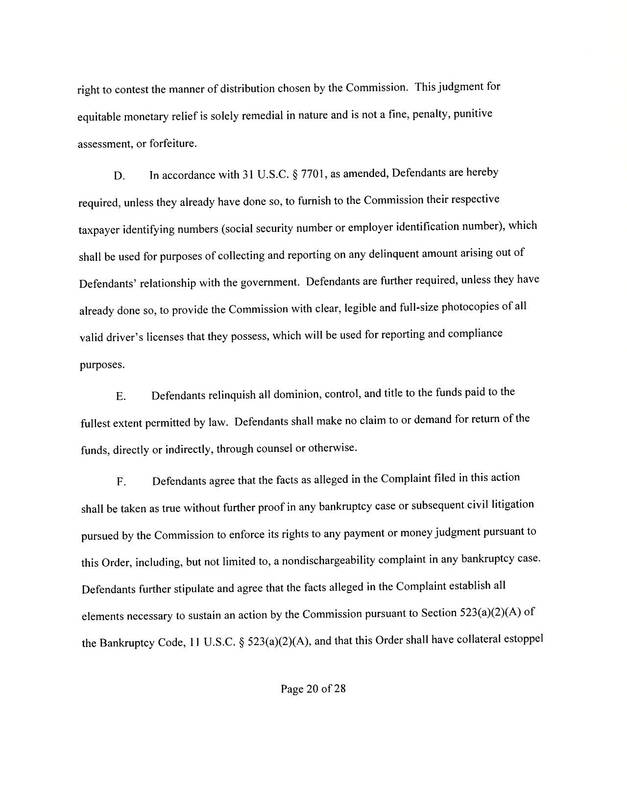 In such case all documents, testimony and records shall be received, heard and maintained by Arbitrator in secrecy under seal, available for the inspection only by Clickbooth or Affiliate and by their respective attorneys and their respective experts who shall have agreed, in advance and in writing, to receive all such information confidentially and to maintain such information in secrecy. Arbitrator shall be able to decree any and all relief of an equitable nature including, but not limited to, such relief as a temporary restraining order, a temporary and/or a permanent injunction, and shall also be able to award damages, with or without an accounting and costs. 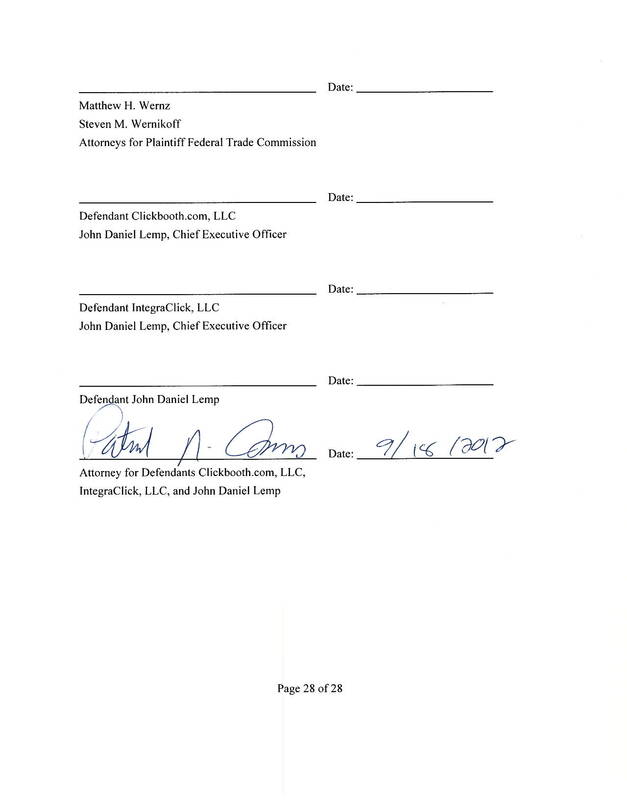 Clickbooth shall be entitled to an award of its reasonable costs and expenses, including attorneys' fees, in any action or proceeding in connection to, arising out of, or under the Agreement. 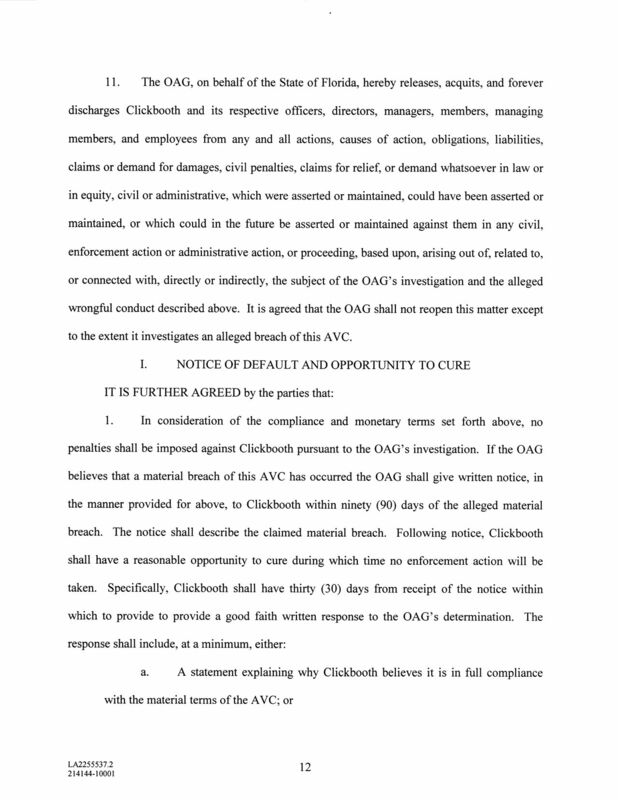 Nothing contained in the Agreement shall be construed to limit any legal remedies available to Clickbooth.To the extent permitted by law, You agree not to bring, join or participate in any class action lawsuit as to any claim, dispute or controversy that You may have against Clickbooth and its employees, officers, directors, members, representatives and assigns. 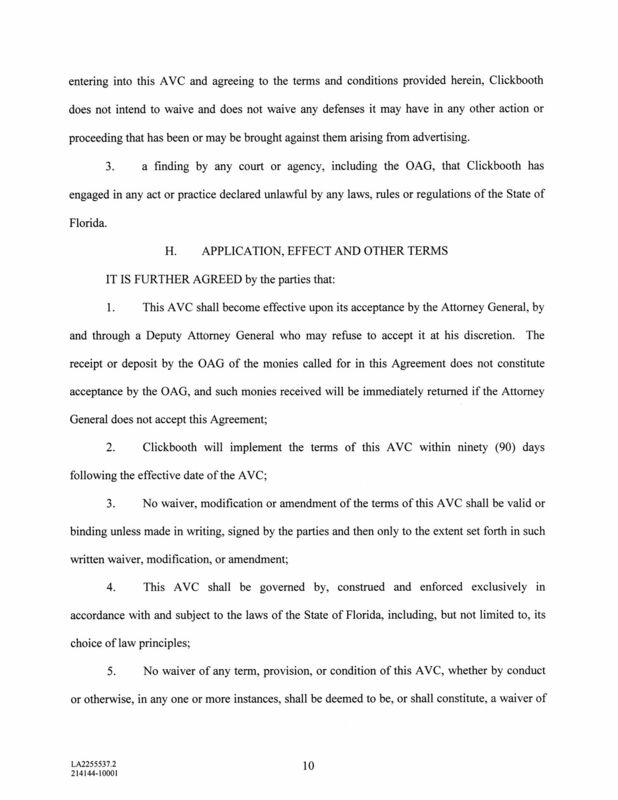 You agree to the entry of injunctive relief to stop such a lawsuit or to remove You as a participant in the suit. You agree to pay the attorneys' fees and court costs that Clickbooth incurs in seeking such relief. 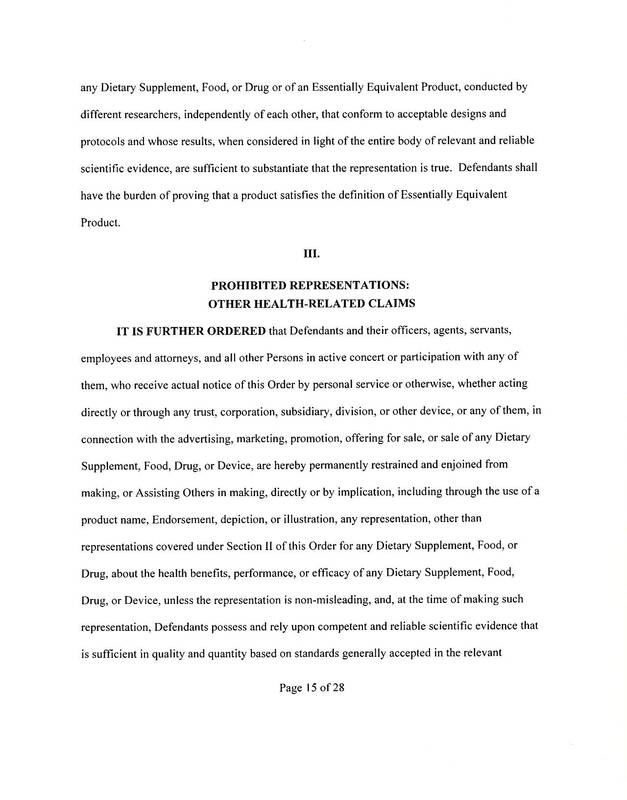 This provisionpreventingYou from bringing, joining or participating in class action lawsuits does not constitute a waiver of any of Your rights and remedies to pursue a claim individually and not as a class action in binding arbitration as provided above. This provision preventing You from bringing, joining or participating in class action lawsuits is an independent agreement. 20. Severability; Non-Waiver. 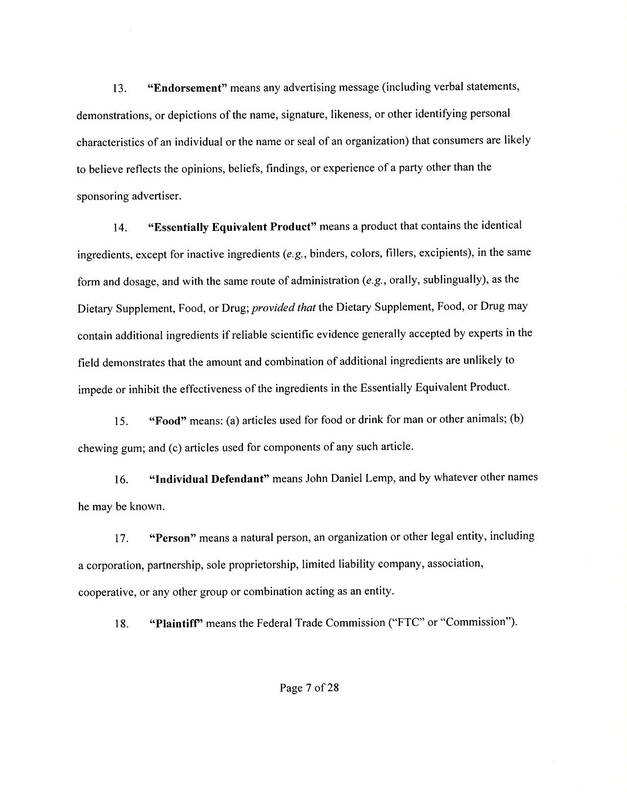 If any provision of the Agreement is held to be invalid, illegal or unenforceable for any reason, such invalidity, illegality or unenforceability shall not effect any other provisions of the Agreement, and the Agreement shall be construed as if such invalid, illegal or unenforceable provision had not been contained herein. No waiver of any breach of any provision of the Agreement shall constitute a waiver of any prior, concurrent or subsequent breach of the same or any other provisions hereof, and no waiver shall be effective unless made in writing and signed by an authorized representative of the waiving Party. 21. Modification. The Agreement represents the complete and entire expression of the agreement between the Parties, and shall supersede any and all other agreements, whether written or oral, between the Parties. Other than as set forth herein, the Agreement may be amended only by a written agreement executed by an authorized representative of each Party. To the extent that anything in or associated with the Clickbooth Network or any Program Terms are in conflict or inconsistent with the Agreement, the Agreement shall take precedence. 22. Confidentiality. "Confidential Information" means any information disclosed to You by Clickbooth, either directly or indirectly, in writing, orally or by inspection of tangible objects, other than information that You can establish: (a) was publicly known and made generally available in the public domain prior to the time of disclosure to You by Clickbooth; (b) becomes publicly known and made generally available after disclosure to You by Clickbooth other than through Your action or inaction; and/or (c) is in Your possession, without confidentiality restrictions, at the time of disclosure by Clickbooth as shown by Your files and records prior to the time of disclosure. Clickbooth’s Program rates are considered “Confidential Information.” You shall not at any time: (i) disclose, sell, license, transfer or otherwise make available to any person or entity any Confidential Information; (ii) use any Confidential information; and/or (iii) reproduce or otherwise copy any Confidential Information, except as necessary in connection with the purpose for which such Confidential Information is disclosed to You or as required by applicable law. 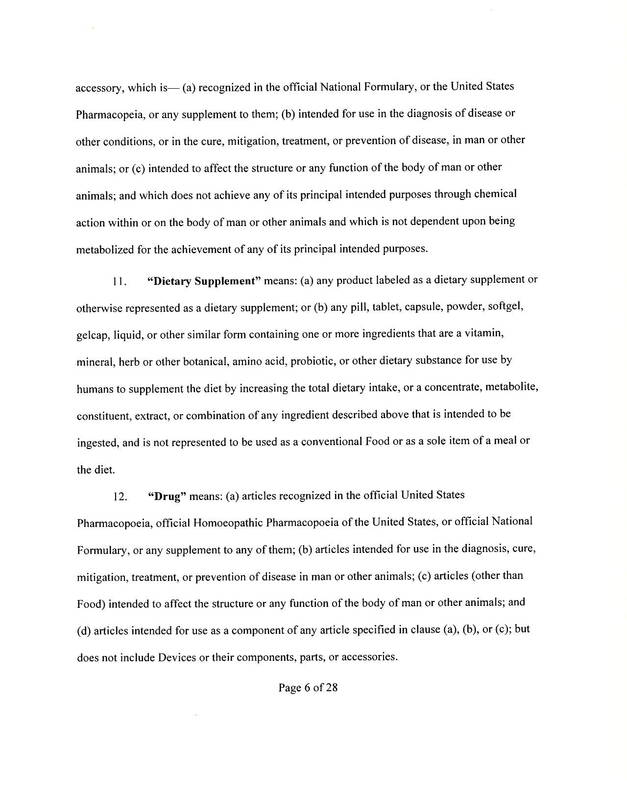 You agree to take all reasonable measures to protect the secrecy of and avoid disclosure and unauthorized use of the Confidential Information. All Confidential Information shall at all times remain Clickbooth's personal property and all documents, electronic media and other tangible items containing or relating to any Confidential Information shall be delivered to Clickbooth immediately upon Clickbooth's request. 23. Force Majeure. Neither Party shall be liable to the other by reason of failure or delay in the performance of its obligations hereunder on account of telecommunications, Internet or network failure or interruption, results of computer hacking, Acts of God, fires, storms, war, governmental action, labor conditions, earthquakes, natural disasters or any other cause which is beyond the reasonable control of such Party. 24. Miscellaneous. You may not use any device, software or routine to interfere or attempt to interfere with the proper working of the Site. You may not take any action that imposes an unreasonable or disproportionately large load on the Clickbooth infrastructure. You agree that any unauthorized and/or unlawful use of the Site, Service, Creatives, and/or Programs would result in irreparable injury to Clickbooth for which monetary damages would be inadequate. In such event, Clickbooth shall have the right, in addition to other remedies available to it pursuant to the Agreement, to immediate injunctive relief against You without the need to post a bond. 25. Ability to Perform. 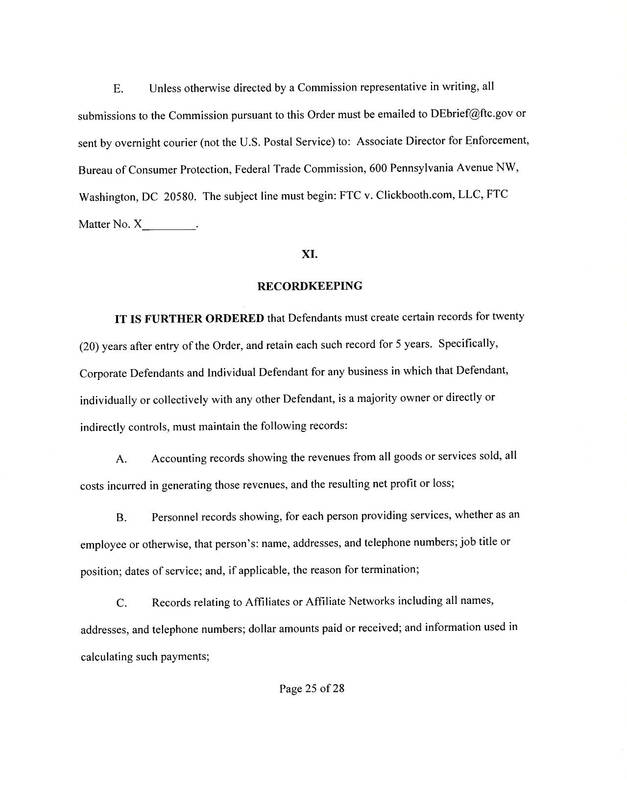 You agree that Clickbooth may require a financial accounting and inspection of Your books and records including, but not limited to, access to Your computer databases, in order to verify and corroborate financial information regarding the relationship established hereunder. You hereby authorize Clickbooth to obtain credit reports regarding Your business and to require You to provide it with reasonable information regarding Your financial position. 26. Relationship. Each Party is an independent contractor and not a partner, joint venturer or employee of the other. Neither Party shall have the right to bind the other or to incur any obligation on the other’s behalf. 27. Notices. All notices shall be sent to the address submitted by You when You sign up for the Service and, if to Clickbooth, to the address listed in the Contact section of the Site. Check the agreement to continue.